What Moved Jesus To Action? What two factors moved Jesus to action? Sometimes we picture Jesus as rushing to meet everyone’s needs and solving all their problems. A careful reading of the Gospels shows that was not so. In John 5, just before the above verses happened, Jesus walked into a place which was crowded with sick people hoping to be miraculously healed. He questioned and healed one man...and then walked away. In another case Jesus was walking and would have past by a blind man, but the blind man cried for help and so was healed. On another level, the teachings of Jesus were not designed to attract the masses. In fact, in the next chapter, the teachings of Jesus were so “hard” that most of His disciples deserted Him. What was it that moved Jesus? His overriding top priority was to do the will of His Father. Jesus was not out for Himself, His career, His popularity, or even for the needs of others. His eyes were on His Father, what His Father did, He copied. If that meant stopping in the middle of a sermon to heal a crippled woman, He did it. 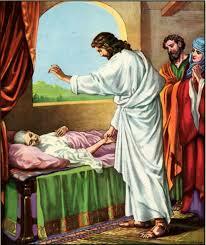 If it meant healing one man in a multitude of sick people and leaving the rest, He did it. If it meant saying things which would turn people against Him, He did it. The model of Christ’s life is perfect obedience to the will of His Father regardless of personal cost. To please the Father was the focus of His life...and He did it without once choosing His own way or His own desire above the Father’s will. The secondary thing that moved Jesus to action was faith. We know that faith is a gift from God. When someone approached Jesus in faith that was a signal to Him that the Father was at work in that life - although Jesus sometimes tested the depth of the faith, i.e. the Syrophenician woman. Often we are moved because we see a need, but that was not what moved Jesus. We some how feel that we have to meet every need. Sometimes we become so frustrated that we do nothing, other times we try to solve every problem and wear ourselves out. [This is especially tempting for Pastors and Christian workers.] We have to face reality. Even within our own families, we cannot solve every problem or meet every need...and we will only end up killing ourselves if we try. As Jesus, through the power of the Holy Spirit, did only those things which He saw the Father doing, even so we, though the power of the Holy Spirit, need to do only the things which we see Jesus doing. This is not an evasion of responsibility, but an entering into true responsibility. I am not able to solve every problem, but God has enabled me to solve some. One of the keys is to know which problems, situations, or needs require our attention and which ones we need to leave alone. This can only be done as we learn to watch what Jesus is doing. We do this by spending time in His Word and in His presence. God does not overwhelm us. We overwhelm ourselves when we take on things God did not intend for us. If what moved Jesus, moves us then we will be successful and safe from God's point-of-view. Side Point: This means that Jesus was not interested in being creative. From our point-of-view, Jesus was very creative, but from His point-of-view His was only copying the Father. True disciples are imitators [of Jesus], not originators.